During a recent investment committee meeting, I recalled a conversation I had back in the early ’80s with a fellow money manager who was much more experienced than me. I asked him what he thought the ideal “paranoid-conservative, set-it-and-forget-it portfolio” would look like. His response: 10% gold for economic uncertainties like hyperinflation and geopolitical stress, and 90% U.S. Treasury bills for stability. Needless to say, hanging on to this 10/90 portfolio would have required loads of patience and stubbornness over the last three decades. It would have performed quite poorly compared to most other investments during the lion’s share of this period, save for times like the early 2000s Tech Bust and the 2008- 2009 Global Financial Crisis when it temporarily shined. Indeed, compared to the 2,000%+ return that the S&P had over this golden age for U.S. stocks, many would call this portfolio’s 200%+ return a real stinker. For the ability to reduce volatility and have less ups and downs, the paranoid investor would have given up a lot and have been financially damaged. Since that conversation, I’ve been thinking about the 10/90 portfolio as a “conceptual” tool for risk and opportunity management. For most investors, parking 90% of a portfolio in T-bills is a strategy destined to fail over time, as taxes, inflation and insufficient income leads to woefully inadequate real returns. But the 10% portion devoted to protect against “what-if ” scenarios has stuck with me. When financial markets are all rosy, such protection seems useless, a zero so to speak. But when economies and business climates turn stormy, hard assets, for example, used as portfolio protectors can play the role of hero. They can provide a volatility cushion when the investor herd panics during shock events like war, broad market bubble bursts, and major losses of confidence in prominent institutions (for example, central banks). And they can provide a source of capital for bargain hunting, assuming the owner of the heroes is willing to part with them when asset prices elsewhere are severely depressed. What we’ve tended to do over the years, depending on market conditions, is allow a small part of our managed portfolios (not always 10%, but let’s call it in the 3%-15% range) to play the zero or hero part. Some might call these positions “black swan insurance” or “tail risk hedges,” but I just think of them as relatively low-cost-to-the-portfolio holdings that can provide real support against extreme market scenarios. Importantly, these holdings allow us to keep the remainder of the portfolio (the “90” conceptually) relatively fully invested in carefully picked holdings that do the lion’s share of our long-term return generation. The two primary investment holdings that have played the hero/zero role over the years in FIM Group portfolios have been stocks of precious metals-related companies and government bonds of long-regarded safe haven countries like Switzerland. The nice thing about these, if chosen carefully, is that the risk of a true “zero” is very low. Other hero/zero candidates like index options see time value decay, which greatly increases the odds they expire worthless. This permanent destruction of capital is hard for a value investor to stomach. So we do not use speculative options or futures to hedge risks at FIM Group. At present, throughout our managed strategies, most of our hero/zero holdings are comprised of a select group of individual stocks with precious metals exposure like Silver Wheaton, B2Gold Corp, New Gold, Dundee Precious Metals and U.S. Global Investors. All are well-managed and should be able to survive if markets stay free of “what-if ” scenarios. In fact, our working thesis is that these stocks trade cheap relative to a positive, longer-term global economic scenario of limited new gold and silver supplies (harder and harder to find and mine the stuff) and growing demand as hundreds of millions of new middle classers emerge in precious metals-loving countries like China and India. Against any number of negative “what-if” scenarios, scenarios that envision a period of fear and panic in markets, these precious metals holdings look absurdly cheap. As for safe haven government bonds as attractive hero/zero investments, they are much less compelling today than when their coupons were rich in yields. Due to central banker policies that have suppressed bond yields (raised bond prices) around the world, available yields for traditional safe havens are quite paltry. In recent weeks, for example, 10-year Swiss Government bonds were so coveted that they actually offered their owners negative yields (meaning their owners were effectively paying the Swiss government to hold them!). The Swiss franc has also been bid higher against the dollar and now trades not far from its long-term highs. So even though a “what-if” moment could push the franc higher and the yields of Switzerland’s bonds even further into negative territory, it seems like the zero outweighs the hero at this time for Swiss govies. Everything is cyclical, so right now we believe precious metal shares are a better way to go than the Swiss Governments. As value and growth investors focused on holistic risk management, we look at the downside first with any current or prospective investment holding. We use conservative assumptions of future competitive advantages, asset values and free cash flows when making estimates of an investment’s intrinsic value, and look at various “fire sale” scenarios to gauge each holding’s exposures to “what-ifs.” This analysis is used to determine the price we are willing to pay. We require more margin of safety than less as the range of potential risks widens. Additionally, we construct portfolios of these holdings in a diversified way that limits concentrations to specific companies, industries, currencies, interest rate scenarios, tax schemes and other variables. And yes, in certain periods (like the current one), we add some “what-if” protection via positions like those mentioned above. 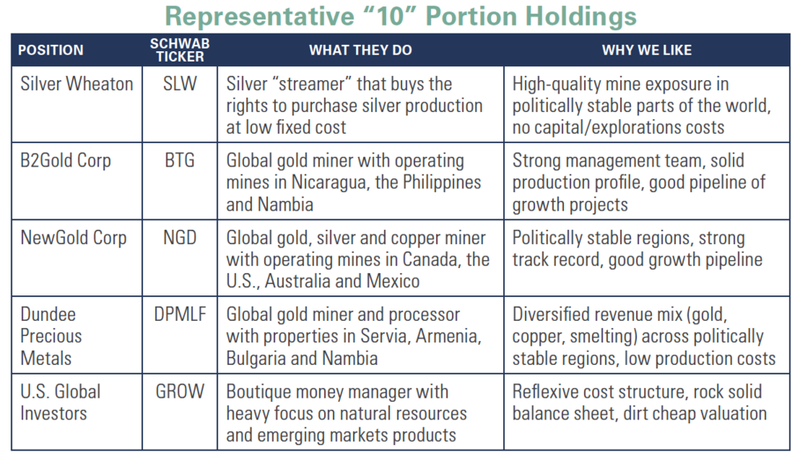 At the moment, given scarcity of value in safe haven bond-land and surplus value in precious metal-land, our “10” portion in the portfolios is largely comprised of gold- and silver-related companies. While these holdings may appear to play the role of zeros in this current period of investor complacency, we expect them to emerge as heroes should any number of “what-ifs” shake things up. Help! I Don’t Know What to Think About Taxes!